It’s not all about materials handling! Hazardous areas also need to be kept clean without risking the safety of staff and the supply chain. To ensure that brands operating with potentially explosive atmospheres (Zone 2) use an ATEX compliant scrubber drier, manufacturer Hako has been working with Pyroban and specifying system6000™. 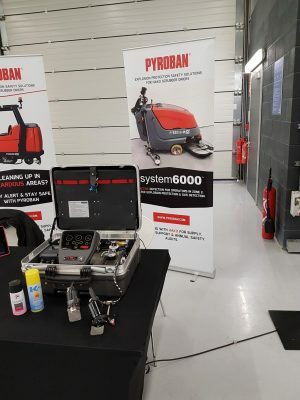 Pyroban can convert an agreed range of Zone 2 scrubber driers, working closely in partnership with Hako to develop these solutions for the B70, B310 and B120 as well as the 980R, 1200 and 1500 (although other models can be quoted). The conversion process takes about 6-8 weeks at the factory in Shoreham by Sea, West Sussex, UK. Most conversions are for use in Zone 2 hazardous areas, where users are interested in alerting their drivers and management to the presence of a potentially dangerous mix of gas or vapour in the atmosphere. Pyroban’s system6000™ continuously monitors the direct environment around the scrubber driers using a choice of infrared or pellistor based gas detection technology depending on the application. Gas detection is combined with various other explosion protection methods, such as restricted breathing enclosures and surface temperature cooling to ensure all the motors, brakes, electrics and other components remain below the auto-ignition temperatures of flammable materials. Static, an ignition source, is now also considered a “normal” occurrence in Zone 2 hazardous areas, so the tyres, seats, hydraulic systems, all plastics and more are modified where necessary. Certified with gas groups IIA and IIB, Hako machines converted by Pyroban have full approval in accordance with the ATEX 2014/34/EU Directive and EN1755:2015 standard. For added safety in non-classified areas, Pyroban also offers Gascheka duo™, which can be fitted onsite and still provide operator awareness of gas and vapour and equipment shutdown. Hako Machines Ltd has now been operating for 40 years in the UK and had a major celebration with customers at Silverstone’s world-famous motor racing circuit in the UK on 14 March 2019. Pyroban had a small exhibit at the event and was pleased to be part of the celebrations. Of course, this year Pyroban celebrates 50 years of “Project Pyroban”. 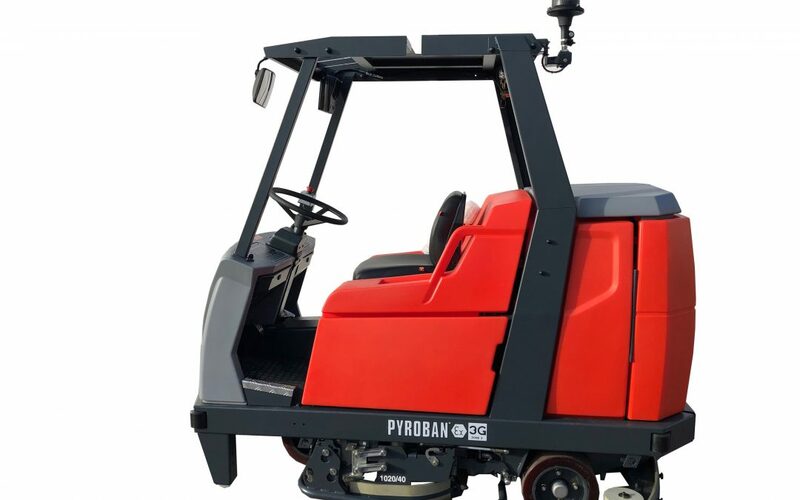 For more information about explosion proof scrubber driers or other mobile equipment, visit https://www.pyroban.com/products/atex-conversions-plant-equipment/.